Showbiz Trucking is located in Brooklyn, New York and handles both the transportation and convenient storage of theatrical property. Minutes from downtown Manhattan, just over the Manhattan Bridge, Showbiz Trucking can facilitate transport to and from any location throughout the United States. Additionally, we operate a 30,000 square foot facility which includes 25,000 square feet of storage space. Our brick warehouse offers Showbiz clients dry, climate-controlled storage with 24/7 security surveillance at well below market rates. Our team comprises over 50 years experience within the theatrical trucking business. Our crews have served television network giants, Broadway property managers, and parade organizers within the metropolitan and tri-state New York area. Time after time, we have proven that our quality of workmanship along with our knowledge of what clients require creates enduring working relationships. We have a management team set up at Showbiz Trucking that handles the coordination of daily transportation needs as well as emergency situations. Should such an emergency arise, specialized procedures will be followed to ensure a rapid response time and quick resolution. We understand the crucial loss of time and expense that can occur under such circumstances and can assure you that in the event of an emergency our team is prepared to handle it as a first priority. We also provide our valued clients with 24/7 access to senior management. All Showbiz Trucking equipment is expertly operated by professional drivers from Theatrical Teamsters Local 817. Rest assured that our crew will handle your property as though it were their own and will address all members of your organization respectfully. Our team has proficiency in proper set and prop handling, safety measures and security. They are experienced in navigating city blocks and well acquainted with city regulations. Moreover, Showbiz Trucking crew members demonstrate timely follow through on crucial delivery schedules. Our well-maintained fleet of modern, large-capacity trucks provides safe, secure carrier transport. We have optimized the container capacity of our vehicles so that we can get the job done in fewer trips and help our customers save money. With trucks ranging in size from 18’ to 26’ in length with up to 8’ of interior width, up to 7’6” in interior height and lift gates―as well as some open-top options―our vehicles can accommodate and transport virtually any theatrical set. All trucks carry a furniture dolly and/or hand truck, for those hard to move props, as well as packing blankets for fragile pieces. Every truck team is equipped with point-to-point radios that keep us in constant communication regarding loading and unloading times―and provide us with a driver’s exact location at any given moment. You’re never in the dark. You will know the in-transit status of your properties and be able to pinpoint delivery times. Our dispatcher will handle all your daily pick-ups and returns, saving you the hassle of continual monitoring. At our Brooklyn facility, Showbiz offers its clients the added convenience of its 25,000 square foot, low-humidity, climate-controlled, 24/7 monitored warehouse where scenery and props from Broadway’s myriad star-studded theatres, movie and television production companies, and metropolitan New York parade organizers are kept safe and ready to be rapidly delivered as needed. When combining both storage and transportation services, Showbiz not only provides a rare one-stop solution that guarantees easy, 24-hour access to stage properties, but also offers better transport rates to and from its warehouse and fast, worry-free delivery. 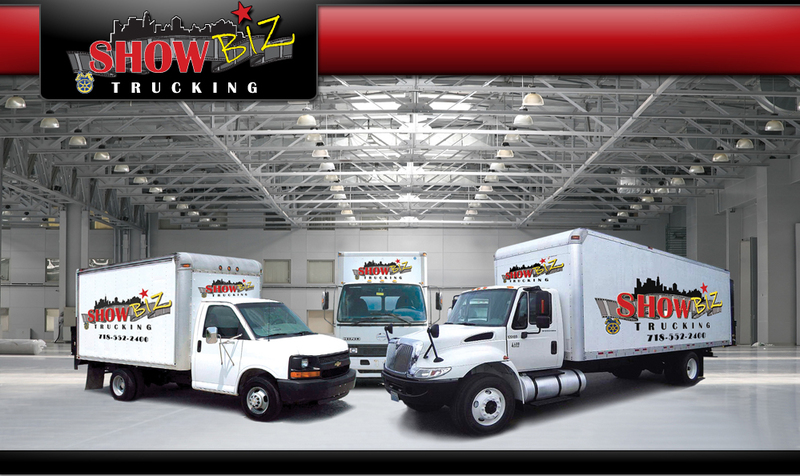 Before you consider using Showbiz Trucking carrier services or warehousing, speak with our clients. Among our long-term, satisfied customers are our NBC network clients: The Today Show, The Weekend Show, Saturday Night Live and The Jimmy Fallon Show, as well as The DR. OZ Show, Macy’s Fireworks, Radio City Music Hall, Macy’s Thanksgiving Day Parade, the Rockefeller Center Tree Lighting and Sesame Street, just to name a few.